The Kelso Folk and Live Music Club’s home for the last decade and more has been The Cobbles Inn on Bowmont Street, off the market square. The Friday night sessions start around 10pm and may attract anything from two or three regulars to over a dozen or more musicians and singers with visitors from far afield. We use a PA system which the club installed with support from the venue. We provide two vocal microphones and two guitar leads, and a table microphone for fiddle, flute, accordion etc., with the ability to plug in others as needed. General accompaniment to performers should be left acoustic. Acoustic guitars form the mainstay for singers but many other instruments make regular appearances. Unaccompanied singing is appreciated just as much as a full dance-tune stramash and you’ll hear originals from the 12th the 21st centuries. Because The Cobbles Inn is a restaurant, children are welcome. It is a safe environment with a friendly atmosphere. Closing on Friday nights tends to happen on Saturday morning; it’s a late session. Taxis leaves from a few yards outside the pub door, and the location right in the centre of Kelso is very easy to find. The club will, from time to time, organise sessions on another weekday night. These will be publicised to members/regulars. 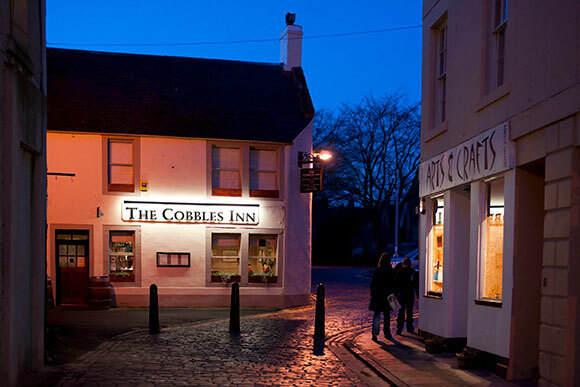 There are now occasional Sunday afternoon traditional sessions at The Cobbles, anchored by local musicians and open to all traditional tune players. Usually there will be a few songs too. Another traditional session is now a regular feature of Thursday evenings at The Cross Keys from around 8.00pm. Anchored by small pipes, fiddle, flute and guitar it’s mainly tunes with occasional songs and the repertoire is exactly what you would expect to hear in a Scottish Border town. The club was started in 1995 when a Perthshire fiddle player arrived to work at Plexus and discovered no sessions were happening in the town. Mike, who has long since departed for England, advertised a meeting to set one up and it has grown on a weekly basis ever since. The club was formally constituted in at the turn of the millennium when three years of sponsored ‘Seasons of Sessions’ brought in funds, donated by the members who anchored sessions round the Borders. These in turn enabled the first Kelso Free Folk Festival in 2003, supported by a council grant.